Having already covered vampires as part of the The Lucky 13, this week here in the Vault--and over at Brutal as Hell--we turn our attentions to that other tried-and-true monster of horror cinema, the lycanthrope. Another creature of ancient folklore, the werewolf has existed in our shared consciousness long before movies ever existed, yet it's transitioned nicely onto the silver screen, becoming the source of many of the genre's finest efforts. The year is 1935, and Universal, the studio which has made a name for itself producing films about Dracula, Frankenstein, The Invisible Man and The Mummy, has turned its attentions at last to the legend of the werewolf. 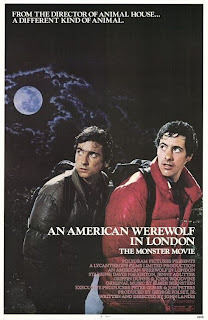 The movie is Werewolf of London, and for some connoisseurs of vintage horror (including this one,) it remains the high watermark of lycanthrope cinema. Henry Hull stars as Dr. Glendon, and English botanist who falls under the curse of the werewolf after being bitten on an expedition in the Himalayas. The vast bulk of cinema's take on the werewolf legend is already established in this one film: the transmission through biting, the transformation under the full moon, the beast's desire to destroy that which its human half loves most. 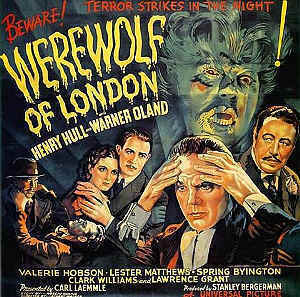 The makeup created by Jack Pierce is striking, and Hull's humanoid, intelligent portrayal of the creature is quite unique, giving us one of the only talking werewolves of the silver screen. The film also puts the transformation scene front and center, a tradition that would continue throughout the history of the sub-genre. Werewolf of London remains one of the most influential, and yet also one of the most underrated horror films of the Universal canon. For whatever reason, in its own day, Werewolf of London did not resonate with audiences to the same degree that previous Universal efforts had. But for my money, it's superior to the much better-known Lon Chaney Jr. film The Wolfman, which came along six years later. This was Universal's first crack at lycanthropy. Excellent Pierce makeup and a fine performance from Hull certify this one as required viewing for anyone who thinks werewolf flicks begin and end with AWIL. Dog Soldiers is the kind of movie that surprises you. At first glance, you immediately know from the DVD cover that it's going to be a werewolf movie, but then about five minutes in, you have to wonder if you've stumbled upon some random war movie by mistake. A group of soldiers are on a training mission in the Scottish highlands, which in itself is rather creepy. The woods are steeped in thick atmosphere, and you can sense something bad is about to happen. What you don't expect, however, is the level of tension that the film unloads after the men come across what is apparently the only survivor of some sort of ravaging attack on a special ops unit. They take the remaining fallen soldier with them and without warning are overwhelmed and pursued by unseen predators. A thrilling chase ensues and the squaddies are luckily picked up by a woman traveling alone on a sparsely populated road. She takes them to a nearby farmhouse, where they regroup and try to come to terms with the realization that the creatures hunting them are, in fact, huge carnivorous wolves. Werewolves. And they're hungry. By and far, Dog Soldiers is a film that lives and dies by the atmosphere it has created. The dark, foreboding woods, being stranded with no recourse in a seemingly abandoned farmhouse, and of course there's this whole man-eating predator thing going on as well. It's a quick paced, well-acted, unexpected romp into the world of werewolves. The action doesn't stop once, the wolves are hulking, brutal examples of lycanthropes, and the gore.... there's a considerable amount, and combined with a moment or two of literal gut-ripping nastiness, it makes for a thoroughly enjoyable film. Tension abounds, and I was on the edge of my seat for most of the time. It's only fitting that director Neil Marshall's next film was also one of my favorites, The Descent. Face it, the man knows how to scare an audience. 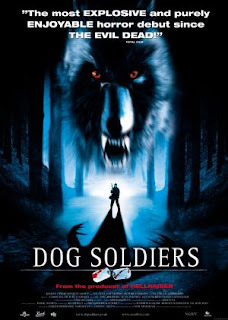 I can count on one hand the really good werewolf movies I've seen, and Dog Soldiers has to sit very high on that list. From start to finish, it's a rock and roll kind of horror movie, amping up the action and shock content at every turn, and giving us a reason to believe the werewolf sub-genre didn't take a silver bullet after all. I have an unconditional love for werewolves. From the earliest bipedals slinking through towering castles to the computer-generated hell hounds that currently rip and rend flesh in modern cinema, shape-shifters hold the power to entrance me with their hoary adventures. So it goes without saying that this week of The Lucky 13 came as somewhat of a challenge for me. No matter what film I chose, I felt there was a legion of other lycanthropic pictures that I was betraying my love for. After much deliberation and plenty cloves of wolfsbane, I was able to narrow my decision down to An American Werewolf in London. Even as my lupine heart ached to include other countless classics, a re-viewing of John Landis’ film proved to me that this was the one to go with. What brings me to this conclusion, you ask? I think it’s the fact that AWIL remains in my mind as probably one of the most well-constructed horror films I’ve ever seen. It is a smooth viewing experience from start to finish, the quietest and most intimate of moments capturing your attention as much as the werewolf mayhem takes hold of your imagination. Landis’ hand at writing and direction creates a film that is pure cinematic magic. The suspense never deadens; he throws us right into the mix with the foreboding visit to The Slaughtered Lamb, and the anxiety never lets up as it leads to the bloody confrontation on the moors. And after that, we don’t see so much as wolf saliva till the hour mark. The entire time we’re wringing our hands, wondering what’s going to happen to David Naughton on the night of the full moon. Even when the tension is released momentarily with the reveal of the monster, we’re in a constant state of anticipation as to when the beast will strike next all the way up to the thrilling climax. One of the most important factors in any werewolf story is having a palpable sense of sympathy for the tragic hero. With David Naughton as the leading man, the audience is guaranteed to fall in love with his likable personality. Even as David senses the impending danger of his curse, he cracks jokes and mugs his way through his troubles in a completely endearing manner. He plays a down-to-earth, easy-going fella who’s just trying to deal with this tremendous weight on his shoulders. He never loses his grip on humor and his constant jabs at the rotting remains of his friend Jack seem like what any one of us would do in his situation. The end of his painful journey can’t help but sadden us and touch us, bringing the characterization of his afflicted hero full circle. This film is what kick started the werewolf renaissance in the '80s, no doubt due to Rick Baker’s innovative and game-changing makeup design. The man worked with the touch of a twisted artisan and created one of the most iconic and memorable transformations/monsters Hollywood has ever seen. For the first time we were explicitly shown just how damn painful it was to morph into a full-grown wolf. The twisting and snapping of David’s ligaments as his body stretches and hair pierces his flesh created a stark, clear picture of the agony of lycanthropy. Baker’s full wolf monster is impressive as well, the bloodsoaked jaws and hellfire eyes imbued with genuine rage and hunger as it rampages through Piccadilly Circus. Baker’s effects are elevated above and beyond the standard gruesome fare and almost become high art in their genius. An American Werewolf in London really is one of the genre’s highlights for a reason. Its brilliant blend of terror and comedy, dynamite acting, spectacular makeup and powerful story brew into an intoxicating mix that’ll keep your claws glued to the screen. Seek this film out, appreciate it, and just be thankful that the horror community has been given such a gift as this. It’s enough to make you want to let out a hearty howl and run through the moon-streaked wood. Join us next week, when it's all about those wacky serial killers! Werewolves have always been one of my favorite movie monsters and these films certainly cover a lot of good cinematical ground for that sub-genre. I'll admit that I've never seen Dog Soldiers, can't really say why, but it sounds incredible! One of my favorite werewolf films would have to be Ginger Snaps. Its such a quirky, intelligent take on the wolf mythos and nigh perfect from beginning to end with some great characters. Thanks! And I agree about Ginger Snaps--it was actually one of the selections over at Brutal as Hell, so you should check that out too. Another favorite werewolf movie of mine. The Lucky 13: Week Eleven: Zombies! TRAILER TRASH: Texas Chainsaw Massacre Edition! The Vault of Horror Gets the Willies! TRAILER TRASH: King Kong Edition!